It is always nice to learn more about the tactics in the business in order to make improvements. Have it all from Mr Ajay K Bhootra, who explains overpowering techniques to successfully sell high value progressive lenses. You know, in this part I’m going to talk about the strategies that I used to sell high value progressive lenses to my customer successfully and I did it over, and over and over again. I want to pull back the curtain to reveal some of them to you all. BUT let me make few things clear. If you apply my techniques in your practice the amount of success that you will get is directly proportional to….. Your willingness to learn and apply new techniques. Your effort to innovate and add to your own knowledge. Your ability to weave a powerful techy sales jargon in front of your customer. Your confidence and commitment to achieve desired results. What is the biggest factor that creates a stumbling block in developing skills to sell high value progressive lenses successfully? If your answer to my question is “Attitude of the sales person” as I also mentioned in my previous article “The Formula 3/5. Why is it so important?” Then I’m afraid you are not correct. That was for sunglass selling. Please understand selling sunglasses is absolutely a different ball game than selling high premium progressive lenses. You don’t sell high value progressive lenses for their functional benefits, nor do you sell for fashion factors. You sell high value progressive addition lenses for the “added values” that your customer would enjoy by using them. So the answer is “your own ability to process and apply information”. Well, that’s my way of thinking, you may have different answer. So I went on a little rampage. I started enquiring lens manufacturer, I started collecting information from the brochures that the lens manufacturer gave me and worked upon that information to create strategy to present high value progressive lenses to my customers. Varilux S series is the result of two breakthrough technology – Nanoptix Technology and SynchronEyes. Nanoptix entirely redesigns the fundamental structure of the lenses during their calculation, opening up new degrees of freedom that reengineers each element of lens and virtually eliminates the swim effect that you usually find in most other progressive lenses. Instead of considering the lens as a whole shape, Varilux S series is the first lens to be calculated from thousands of tiny virtual elements. SynchronEyes Technology optimizes binocular vision to provide wide angle vision. It takes into account the physiological differences between the two eyes: the optical design for a given eye, takes into account the prescription of the other eye, to guarantee similar retinal images between the two eyes. The revolutionary lens virtually eliminates the swim effect for a better equilibrium in motion and optimizes binocular fields of vision for wide angle vision. You get a pair of lenses that provide you flawless vision and also ensure that you don’t feel wary when you go down the stairs or move your head. Physio NE 360 progressive lens design uses the CAP Control and WAVE 2 Technology that controls and minimizes the effect of COMA aberrations. Power Control technology ensures that there is no buffer area below Near Power Circle. The application Axis control technology at the unwanted astigmatic zone ensures that the width of intermediate vision zone is increased by appr 30%. The lens provides you improved night vision and also enhances depth of near vision. Varilux Comfort lens com­bines the advantages of both hard and soft design together. It is designed ergonomically to maintain wearer’s natural body and head positions together with the habitual reading distance. The near zone in Varilux Comfort is positioned higher than most other progressive. As a result most users do not have to lower their eyes as much as they need to do with other progressive lens design. The result is that the user can reach the reading portion more easily and quickly without making unusual posture. What it means is that you enjoy the benefits of wider near areas that you can feel with larger lateral eye movement. It also reduces the head movement. Enough to reduce neck strain. Backed with the strong brand value of Nikon, Presio “W” Progressive Lens is world’s one of the most advanced progressive lens design. It uses Dual Power Progressive Design technology which means progressive surface is on the front side of the lens and the back side of the lens is designed to cancel the aberrations of the front surface progressive design. 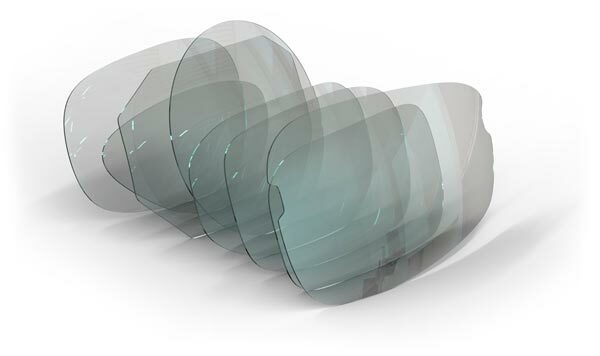 The lens uses Back Filtration Technology that generates a “Power Aberration Filter Surface” to optimize the lens design and minimizes the effect of distorted zones of the front side progressive lens design. The lens provides enhanced corridor or channel of clear vision, smooth power transition from distance to near and improved overall global performance of the lens. The lens ensures that adaptation is quicker and smoother. Based on my own experience, I can say that there is a crying need to look at selling techniques of high end progressive lens; it cannot be achieved by using the old and traditional methods. Each design or brand needs to be looked at individually so that it can be presented to the prospect uniquely. Powerful communication coupled with digital demonstration is critical to establish a meaningful differentiation in the customer’s mind.